JOHN 6:35 KJV "And Jesus said unto them, I am the bread of life: he that cometh to me shall never hunger; and he that..."
32Then Jesus said unto them, Verily, verily, I say unto you, Moses gave you not that bread from heaven; but my Father giveth you the true bread from heaven. 33For the bread of God is he which cometh down from heaven, and giveth life unto the world. 34Then said they unto him, Lord, evermore give us this bread. 35And Jesus said unto them, I am the bread of life: he that cometh to me shall never hunger; and he that believeth on me shall never thirst. 36But I said unto you, That ye also have seen me, and believe not. 37All that the Father giveth me shall come to me; and him that cometh to me I will in no wise cast out. 38For I came down from heaven, not to do mine own will, but the will of him that sent me. And Iesus said vnto them, I am the bread of life: hee that commeth to me, shall neuer hunger: and he that beleeueth on me, shall neuer thirst. [And] Jesus said to them, I am the bread of life: he that comes to me shall never hunger, and he that believes on me shall never thirst at any time. And Jesus said to them, I am the bread of life: he that cometh to me, shall never hunger; and he that believeth on me, shall never thirst. I am the bread of Life, replied Jesus; "he who comes to me shall never hunger, and he who believes in me shall never, never thirst. And Jhesus seide to hem, Y am breed of lijf; he that cometh to me, schal not hungur; he that bileueth in me, schal neuere thirste. 6:35 I am the bread of life - Having and giving life: he that cometh - he that believeth - Equivalent expressions: shall never hunger, thirst - Shall be satisfied, happy, for ever. 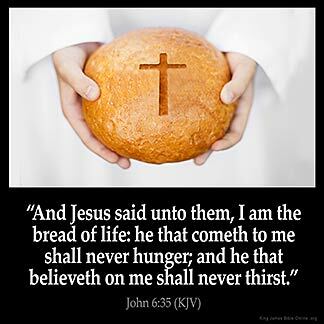 Joh 6:35 Jesus said unto them, I am the bread of life. They ask for this bread. He answers, it is here; I am that bread. The work of God is that you receive it by believing upon him whom he hath sent. He that cometh shall not hunger; he that believeth shall not thirst. It is thus shown that faith is the power that brings us to Christ. We come to him by believing. I believe that this verse says a lot: To me; the things that the world has to offer leaves you wanting more and more; therefore more thirsty and hungry(in spirit ,soul, and, body). When we come to Jesus and allow Him to fill that hunger and thirst with what He has: I will not hunger and thirst for that which does not meet what I thought would fill my hunger and thirst from what the world and/or the devil has to offer. The devil:death. Jesus Life ,Peace, Love, Security. In John 6:35 Jesus statement "come to him, he is the bread of life" is telling us that we no longer have to feel stress out, broken, or alone. in him we can experience abounden life. But the key is BELIEVE. Believing that he is, and that he can. In Matthew 11 Jesus tells us, Come to me all that weary, and I will give you rest. Meaning never to thirsty again. We can never experience real life, real peace until we surrender our will, our all to him.